First create a database named “mydatabase” in MySql. Then create a table “tbl_user” with three fields (id, username and password). 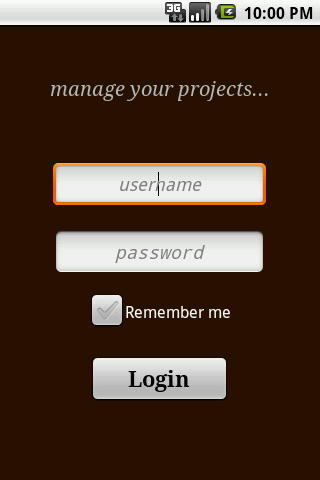 The next step is to create a php page which will communicate between the MySql database and the android application. Then the main PHP file is to be created. Actually the android application will call this php file along with the data(username and password ) and this code will check the database. If the details is valid then it will return “Y” and otherwise return “N”. Here the data is passed as POST method. We can also use GET method where the data is passed along with the url . Android support both these two features. $query_search = "select * from tbl_user where username = '".$useremail."' AND password = '".$password. So by now we created php and the database part. Then we have to focus on android section. For this first create a xml file which will be our login screen.The screen look like this. The layout of the xml is displayed below. Note : if you have any problem in working with this post, please check this more simple version here. Here is another more detailed explanation. what are Smart App Banners in ios? Xcode 6 crashes when validating or submitting app archive. Solution for CoreData Multithreading problem. in my case my new activity is not started plaese help me anyone ? what is happening? Is your app crashing? can you pls tell me what permissions to write in manifest.xml???? and the namevaluepair is giving error……. I dont know why???? Place this before or after the application tag. It is a collection…..No need to add permission in the Manifest. Only Internet Permission is required…Can you specify the details of the error. import org.apache.http.NameValuePair is already insert. I think there is some problem in the case. change the “namevaluepair” to “nameValuePairs” in the error line. I think this will work. It might have occured when i copied the code……. plz…..can you post your enyire code…i’m trying get conn.btween mysql database in android app.for many days but i failed….!! hello….i try this .. i dont know implement this ……..
http://10.0.2.2/ /// is it local host ……. Try creating a sample file in the localhost and a simple echo inside it. then connect using the above code. This will work. make sure you are printing out the output. The output will be a stream, make sure to convert it to a string.. I got lost somewhere here… how do you use connection.php and user_validate.php. are you referring to a one file sir? I got invalid user response and when i check the logcat it says something like no window to dispatch pointer action 1. Those are two files, the connection.php is used for connecting to mySQL database and other file you can use as you wish , you can have anything inside it. The error you got is not due to these files. Thanks for another informative website. Where else could I get that kind of info written in such an ideal way? I’ve a project that I am just now working on, and I’ve been on the look out for such information. Thanks for your tutorial .this was really helpful. But i need a favor , can u show me how to insert values of radio button , check box and dropdown list into mysql using php. If you could help me through this then i would be really thankfull to you. identify each values with a key. Like if there are two radio buttons like male and female, then add to the database as 0 or 1 and then while retreiving from the database just check whether it is 0 or 1 and check the radio button. Do the same with other controls also. k frnd…..bt usually this error occur in above mentioned situations…thas why…Have you tried creating a new project and then copying the contents..
What are your problems? Type in here we will help u. Sorry pankaj, U can send us emails. We will reply as fast as we can. Great tutorial, but lets just say that I wanted to have a home page after a successful login. How do I go about that? Point me in the right direction. Create a new class that extends activity and call this class using startActivity. Im facing this repeatedly…. but there is no error shown in the java as well as xml code. is there any problem with php? im using xampp and ive changed the host address… i got a folder inside it and saved those two php. in the java file also i have provided the link for php. Pls reply. Thanx in Advance. And also i need to know…. how to get redirected to another page after that validation…. thanx fr ur support…. Create another class that extends activity. here I name it secondActivity.java that extends activity. Note that It should have onCreate function like anyother activity. After that call this function. call finish() on second_activity to close the activity. Hello Jeba :- No, that problem is probably not from the php side. When you get this Force Close open the Logcat window from the “window->show View-> Logcat. You will be seeing the error in the red color. Paste that error( (first two lines) here then only I can help you. Did you put the “http://” in the url. Thank u fr d prompt reply sir…. i have put http already. here is the report from log cat… kindly resolve this issue for me. “Application has stopped un expectedly… ” then Force Close Button…. Dear sir James, currently i.ve started to do a Simple Mobile Banking App as assignment to collg. it will be realy helpful if u send me any sample codes of any simple mobile banking with basic functionalities…. thanx in advance. Sorry Jeba, I can only help you if you have any doubts. Ask your doubts and I will clear that. dear sir…. as u hav asked i hav pasted the first two lines of the error frm the Log Cat…. Oh Jeba, this is not enough. My suggestion is try commenting each like inside onclick function and see which line has the problem. Or Can you see the a line starting with “cause” in the Logcat when the app crashes. Paste that line. Hi Jeba: Print out the username and a password you are sending from android from php file and see. I cant undrstnd that…. hw to do? u mean to echo in php? wil u pls giv me an example ? pls…. NO frind…..In java print the result from the php script using LOG.D, the result you can see in the logcat…or use TOAST to display . i’m sory … i ve tried .. im nt able to find…. will u show me hw to do that ? im a very started to android and programming…. It says layout.login isn’t in my R file, now there is a layout.main and since R is the autogenerated file, it deletes any manual alterations to it. When ever I try to launch this program in my emulator, it just force closes, I can’t seem to find any error messes or anything. So I’m a little lost as to why this won’t atleast open. Hello max: Check the latest post. This will help you. i like this most and it’s really nice site and good content it had and above script will help me lot thanks for it…..
Are you getting any response from the server side while running the code. Try to echo back the values you are sending from the android side(eg. Username and password). Or try this code. we have redone this code to help it understand more easily. Hi James, I’m new to android, I already search and trying many example on how to retrieve data from Mysql to android but seem no one success. :<"
Nice Tut, there is only one problem I am stuck! It doesnt even open in the AVD I get the error in the error console after the code suddenly stops while compiling. Please help me. I am researching for my final year project and I really need my android app to connect to a MySQL server. the android code is great, but your explination of what to do with mySQL and PHP lost me somewhere. What php files need to be created? I see reference to “connection.php”, ‘Connections/localhost.php’, ‘the main PHP file’, and “user_validate.php”. But I only see code for two php files. Am I suppose to create a ‘localhost.php’ file? I was able to get it working. In the first line of your “user_validate.php” you reference ‘Connections/localhost.php’, which I believe should be ‘connection.php’. To get things working I replaced the first line of the “user_validate.php” with the code needed to connect login to the host server. I understand that proper mysql coding suggests having a separate file with he login credentials, but I was shooting for simplicity. Solid information on the android side. Best code I have seen with regards to this. hello there and thanks for the post! thanks for your quick response james!! Please check the id’s in the xml and java whether they match or not. Im facing this repeatedly…. but there is no error is displayed in logcat..how it is cleared..help me …. The buffer.charAt(0)==’Y’ is not working for string.. Please slove the problem ASAP………. or buffer.charAt(0)==’Y’ will work for string. PLease print that string in the logcat and check. or sent another string from php side and check it in the android side, like send “success” and compare that string in the android side. I am getting this error frequently when making HTTPConnection. I have tried with various link.It behaves same with all. Why dis error is displayed…help me…. 01-09 19:57:35.046: D/gralloc_goldfish(556): Emulator without GPU emulation detected. Hi….am finished ur login page successfully completed..now i like to need next activity..that next activity having logged in user firstname and lastname detail…so i wrote one query.. This is really easy save the logged in username in a global variable or preferences or extras in the activity.Then get it in the next activity and query again the database with this username. that’s all. check these links for setting the global variable and for passing the extras in the intent. thanks for very useful solutions…but i can’t handle it…so how is handled dis coding in our login page..
Hey jenny:- you decide your username and password. This question is irrelevant. Ur username and password should match the fields in the database, that’s all. ‘EditText_value’ should match the same variable that u use to send the parameters in the namevalue pairs. It is also case sensitive. hi james,how to insert spinner(combobox) and checkbox values from android to mysql..please send d syntax also sample code if u have…v used scrollview 4 joining all those forms.. ur info s really helpful…please help us…. Hay jenny:- First make a string with comma seperated with all the values in the spinner( like this “value1,value2,….”). Now send this to the mysql database ans store it there. Now when you want this , send this string from the mysql database and split it in the android side and repopulate the spinner. that’s all. Please leave comments if you have any doubt. You can send me messages on facebook, twitter and G+ also. vat changes i shld make in this code……..and if the chechbox is clicked how can i store the changes in mysql…. could u pls make the changes in tis code & clarify our doubt regarding checkbox….Thanks 4 ur help…..
we are getting the error as [Ljava.lang.String;@412a9750 in the column of the table..
v got d o/p for spinner…thank u… if the chechbox is clicked how can i store the changes in mysql…. if u have sample code for retrieving data from mysql in JSON format,can u pls send us…thank u soo much ..
Never tried it. I will check that. Jenny : to Listen to checkbox add a listener to the checkbox and on isChecked() option run the code to update the SQL. I will put a simple post on this soon. like if weight is greater than 120,the textbox colour has to be changed….pls help…..send for checkbox also..pls reply james sir ..
We hav some doubts in the following program….this s for higligting the values if the value is 120….bt the color s nt getting changed…can u pls tell us vat modifications i shld make in tis code…pls help…v already posted u tis bt it was nt copied properly…..
Change “et.getId() ” to Integer.parseInt(ed.getText().toString()). I am new to android apps, php, and sql. The main PHP code, is that a part of the connection.php file? If not, where do you create one? Can it be created in Eclipse? If yes, what folder should it reside under (e.g., res, assets). Any help is appreciated. Thank you. yes create two php files connections.php and the other file. Then include the connections.php in the second file. OR you can put the two codes in the same file also. Do I have to move this file to my Android app as well? If yes, in which folder do I save it? The php code in my previous post didn’t paste in its entirety. Anyway, I have one php file named connection.php, which contains both codes. The one below your comments: “For this create a “Connections.php” page as shown below” and the other one below “Then the main PHP file is to be created”. I really appreciate your help. It’s been a frustrating two week for me as I can’t seem to get passed the Login page point let alone do something else. Hello Dan, by including I meant including the ‘incude’ statement in php. Create two files inside your xampp/htdocs/test/ folder and that’s all. then call this php file from the android side using my example. If you want another simple explanation then see this post Android phpmySQL connection redone. Would you mind sending the entire code including php files to my email? I am showing a whole bunch of syntax errors that I can’t figure out how to to fix. Hello Dan. PLease check your mail we have sent you the code. or else you can check this post where you can download the source from the link below the post. Hello Dan, These are not errors. Activity not started…. means you have run the code once and you are trying to run the code without editing anything(means no build change). after entering user name and password and hitting Login, I get “Validating user…” message and then nothing. The screen doesn’t change to userpage.xml. Even when enter incorrect user name and password I get the same. Is it possible that my app is not talking to “mydatabase”? Are you getting anything in the LogCat. First check whether you have internet connection in the emulator and check the important points I have written in the post. If you follow the steps exactly it will work for sure. check whether your emulator has internet connection and also check whether the server is running. any ideas as to why userpage.xml doesn’t kick in? Check the logcat. You may not have decalred the UserPage activity in the AndroidManifest.xml. I got it to work. Finally!!! I had my UserPage activity in the Mainfest file in the wrong spot! What I am trying to do next (now that the user is logged in) is to have the android client pull the data (e.g., list of names) from remote Db and display as a list to the user. Can you please suggest how do I go about doing that! Or can you suggest a good tutorial. Pingback: How to create Simple Login form using php in android? - Connect php with android. Hello, haw to update date from mysql database ?? Hello Mourad:- After all date is a string, make it a string and update. yes i thinks so ..!! Check the reason for force close in the LogCat and paste the reason here. Then only I can say anything about that. Check the reason for force close in the LogCat and paste the reason here. Then only I can say anything about that and reply. org.apache.http.conn.HttpHostConnectException : Connection to http://localhost refused. Can you help me out. Thanks! This is the problem with your php code. please check it. please help me, The code run fine on emulator but whenever I run the app in android phone and click on login button, app is getting crashed and stops unexpectedly. PLease paste the LogCat error here, then only I can give you the solution. It doesn’t connect with the server.. When I run login.php i have the URL on address-bar like this “http://localhost/my/login.php” when i used it instead, android app crashes… What should I do? thanks for ur tutorial.i need a coding for storing the info in database(Mysql)using PHP.pls post any tutorial or send me coding..my mail id is logupushpa5@gmail.com as soon as possible. I have been searching for such kind of tutorials from last one month. Your posts are simple and very easy to understand. Keep posting new posts. Hey james…Thanks for this tutorials. But there some problem I face that whenever I try to connect its show wrong username and password and on the below of app show “response from our domain_name”.and full code which show if u check from browser. Help me pls..
Did you checked your php code perfectly in a brower by hard coding the values before using it in android?